Some of us have the distinct memory of weaving up and down the aisles of Kim’s Video– or really, any old-school place of a similar disposition with B-film and cult-movie analogue tapes galore– while an endless stream of campy horror flicks played on the junky old TV set. Did you ever feel a burning desire to run your fingers up and down the spines of those dusty VHS tapes? Then use those same gritty fingers to grab handfuls of mushy bananas and stuff them into your face? 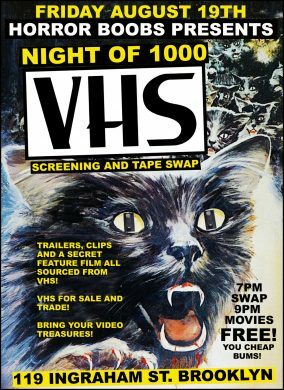 If somehow the answer to this twisted fantasy is “yes,” then you best get over to Terra Firma tonight, because believe it or not all these things will be available to you there, coz lord knows the days of the video store (it’s kind of like Netflix, only IRL) are over and done with. This is where your people are now.